Presented by Corvallis Bicycle Collective, a nonprofit bike shop where anyone can use no-cost tools & mentors. Regular Registration: For families registering 1 or 2 children. Entry is limited to ages 12 and younger. PRICES INCREASE MAY 1. T-shirt not included in registration fee but may be purchased below. Family Registration: For families registering 3 or more children. Entry limited to ages 12 and younger. PRICES INCREASE MAY 1. T-shirt not included, but may be purchased below. Scholarship Registration: Fee waived for children who qualify for free or reduced lunch. LET US KNOW if your child wants a t-shirt. Sponsored Registration: Event registration fees will be covered for members of Samaritan Choice and InterCommunity Health Network CCO health plans. T-shirt not included but may be purchsed below. While supplies last. Price of shirts goes up at event. We need you: $20 can help get another kid on a bike. We show up in underserved neighborhoods, distribute and fix bikes, give away helmets [+more] and lights, and listen to residents tell us about their needs: Kids need a healthy outlet for play. Kids want to learn hands-on bike repair skills. Families need resources to bicycle together. Residents need a reliable, sustainable way to commute to school and work. 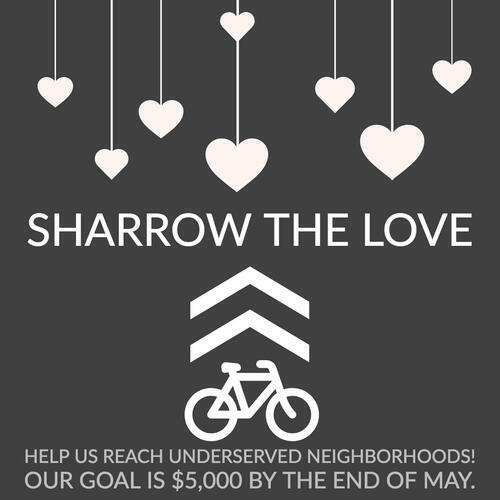 Your contribution to our $5,000 goal by the end of May helps get more people on bikes. Thank you!